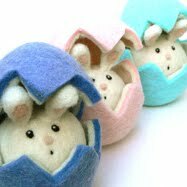 I am dedicating this kid craft project to our friend Amber woodmouse, who was one of the original founders of the Etsy NaturalKids Team. Hopefully she will see this post and be proud of our efforts to keep the Naturalkids Team going strong!I realize that not everybody may own some of the tools used (for example: a vice) but maybe you could pay a visit to a friend’s, grandpa’s, or an uncle’s house and have them do this project with your child. 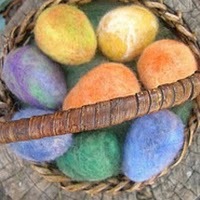 Know any crafty aunts and grandmas? Please, don’t be scared to try this! I swear I am not much of a woodworker, and if I can do this with the kids, anybody can! 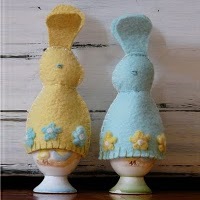 This craft is fun for girls and boys alike! Young and old will be pleased with the results using these simple natural materials. My son has loved working with wood since he’s been a little fellow, 3 and 4 years old. My husband and I have always encouraged him to work on wood projects in the our basement. Please, keep in mind that this craft needs quite a bit of adult supervision! You should stay right by your child’s side and help them every step of the way, especially if they are younger! You know your child best! The amount of supervision depends on your child’s skill level and personality. I recommend it for kids 6 and up who like to swing a hammer and have an interest in wood work. 1.Take your piece of scrap wood and put in the vice. You will need rectangular pieces of wood cut into about 3-4 inches long sections. We used some old pieces of pine wood from a yard project. They were slats measuring 1.5x1x10 inches. 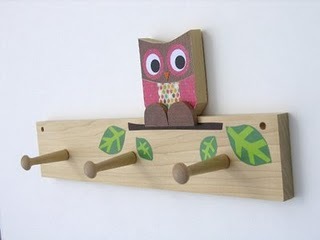 This craft is great for teaching your child about measuring. You can have them measure and mark off several pieces. Have them draw straight lines across the wood piece and then cut along the lines. 3. With the wood piece mounted in the vice, have your child use a wood rasp to smooth out all the edges. You may have to change the position of the wood several times. The head section needs to be flattened and shaped into a nice pointy nose. The back end can just be slightly rounded off. Don’t forget the sides! 4. Mark off the position of the eyes, ears, and tail with pencil. Then have your child hammer two nails all the way into the wood piece where you marked the eyes. They should be a closer together than the ears! 5. The next step is probably best done by an adult. Drill three holes in the spot where you marked the ears, and the tail. 6. Cut out ears and long thin piece of leather for the tail. 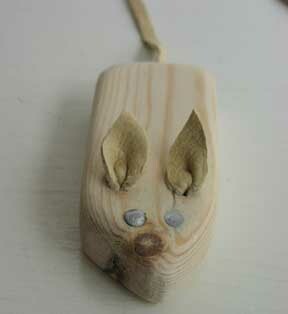 Use a few drops of wood glue and glue the leather pieces onto the mouse body. To see more items from The NaturalKids Team go here! I have two daughters ages 9 and 12, who help me a lot in the workshop. It’s great having them around and they give me a lot of great feedback for my toys. I have a BS in Finance and MA in Economics. I have worked in many different fields including finance and as a consultant in economics. I have also worked as a software engineer and a flight instructor. I like making toys the best and have been doing it the longest. 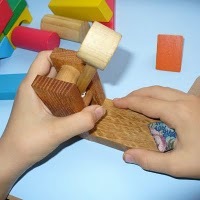 I started making wooden toys when my first daughter was two and I made her a locomotive. It was a big project and looked beautiful. It kind of lit a spark for me that eventually became a full time job. I like to make toys that do things. My favorites are rubber band powered vehicles and catapults. What got you started working with wood? I started out taking a woodworking class while in grad school. I made an end table. After that I built my own house, and built the cabinets for it during the winter before we broke ground. Tell us more about your “off the grid” work space? My workspace is the basement of our house. So my commute is down the stairs. We aren’t off grid, but we do have thermal solar panels that makes our hot water and photovoltaic panels that produce about a third of our total electricity consumption. I have been on Etsy for 1 1/2 years and it’s been great. Orders trickle in during the year and stream in at Christmas. It’s a nice place to get exposure both for retail sales and linking up with wholesale clients. Keep at it, your business will build over time and don’t be afraid of nurturing wholesale accounts. The natural kids group has been very helpful. The efforts as a team I think have made a big difference for me. Also there is a lot of very good advice that team members provide. I’m not sure if I have good thoughts on this subject, however I have seen plenty of eyes twinkle when kids(young and adult) pick up a catapult and imagine the trouble they can get into. Tell us about yourself and how you became an artist..
My name is Wanda Hirsch and I live in Derry, New Hampshire with my 4 business partners. • My husband, who is my patient teacher, providing me with all the skills needed to use saws, drills, and power tools. • My 5 year old identical twin boys, who always provide me great feedback along with lots of wonderful hugs when I am feeling a bit tired. As a child, I grew up in rural Maine climbing apple trees, skipping stones, balancing on old rock walls, and creating lots of gifts for family members. These gifts ranged from paintings and collages to wood boxes and baskets – you name it, I did it. My most precious creation, to this point, was a painting of my grandfather’s childhood farmhouse (very amateur I must admit). However, it was hung proudly in my grandparent’s home until they passed away and now hangs in my mom’s home. My grandfather used to say he wouldn’t sell it if someone had offered him a million dollars. This filled me with such joy! This is the same feeling I have today when I send one of my products to a mom creating a special nursery or a parent and child working on a “big kids” room. An Artist? I would call myself a designer and creator. I have a degree in nutrition and worked several years as a Registered Dietitian. First, working in a hospital, then teaching low-income inner city moms, and lastly working on a breast cancer research study. It was 6 years ago that we moved into our 1830’s New England farmhouse and I rekindled my passion for designing and creating. With lots of imagination, a little non-toxic paint and colorful papers, I was able to transform neglected bedrooms and old dressers into creative, fun designs that my children adore. When I started “redesigning” my children’s bedrooms and furniture, I knew it was time to extend my craving for design into products for others. So, here I am designing, creating and loving life! Tell us about Maple Shade Kids and What you make and sell? 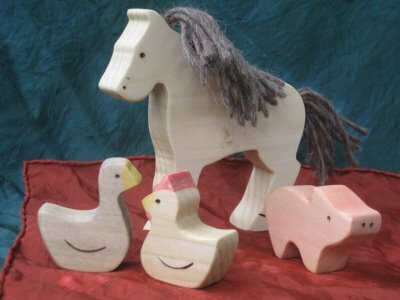 At Maple Shade Kids you will find unique, earth friendly wooden children’s décor and art. In my designs, I strive to elicit joy, nature and love by combining the natural beauty of wood grains along with fun patterns and colors in paper. This combination creates such a happy and organic feel. How did you become inspired to make your wares? My motivation to create comes from my desire to bring a little bit of love and happiness to a person’s home. I tell my husband if we ever become independently rich (yeah right! ), I will continue to create, but give my products away. It fills me with so much pleasure to know that I can bring a smile to someone’s face. I get excited to take a beautiful piece of wood, turn it into something that is fun and unique and have it placed into a special child’s room. What are the materials you use in your products? My products are created from a combination of FSC-certified wood and rescued wood. FSC certified wood is sustainably harvested wood coming from well managed forests and certified by the Forest Stewardship Council. The FSC works to eliminate habitat destruction, water pollution, displacement of indigenous people and violence against people and wildlife. Most of the rescued wood I use in my designs comes from a ship builder’s scrap pile. .
Any Advice for anyone interested in starting to sell on Etsy? • Create a product that you love and that makes you proud. • Learn how to take great pictures. Pictures are so important when it comes to selling on-line. Again, refer to the Etsy Seller’s Handbook for some great picture taking tips! • Think of the whole package! Packaging is the extension of your product. Give your customers a feeling they are receiving a gift versus just a product. Try to put as much love and thought into your packaging as you do your product. Carefully wrap each purchase, enclose a personal thank you letter or card, and maybe give them a small gift letting them know how much you appreciate their business. I believe this type of care and concern, along with a quality product, is what brings customers back. • Find balance. Don’t work too hard or too little, write lists, set small daily goals, and have fun! Currently, I am strictly selling on Etsy. It’s perfect for me, and fits into my lifestyle beautifully! Any easy Earth day tips you want to share? • Along with spring, comes spring cleaning (who has time, right?). Well, if you do get the spring cleaning bug, try to ditch the harmful chemicals. Vinegar and baking soda can be used to clean almost anything. Mix in a little warm water with either of these and you’ve got yourself an all-purpose cleaner. • Billions of plastic bottles are thrown in the trash each year and take up valuable landfill. Save some money AND the environment by drinking from the tap. If you are travelling, use a steel water bottle filled with tap water. • Try to buy organic when you are able. It isn’t just about avoiding the yucky pesticides that can make us sick. It is also about helping protect our waters and soil, and about creating a healthier environment. • If possible, avoid or decrease the use of plastic baggies. There are lots of icky toxic chemicals needed to make them and it takes lots of energy to manufacture and transport them. Instead, opt for reusable containers and/or earth friendly reusable sandwich/snack bags. They are available in so many fun colors! Etsy has some great options to choose from. • Think twice before buying new. I have to confess: One of my favorite pastimes is turning worn furniture, sometime left on the curbside for trash, into pieces I love. Our home is filled with reused stuff. My grandfather’s old wood desk now is my “business station”. An old kitchen table (that came with the house) now works as my art work table. An old buffet from my grandfather’s farmhouse is now painted sunshine yellow and is used to store my children’s school papers, bills, and office supplies. An old window now serves as a unique picture frame. It feels great knowing that I have prevented so many items from being thrown into land fills, plus they are quite unique! • I can’t pass up this opportunity to say buy handmade natural gifts! It’s a win-win situation. We are supporting talented artists AND as a consumer we receive a unique product, full of love that helps preserve our earth by avoiding the mass production of products. This cuts down on global warming in addition to avoiding all that plastic packaging and annoying twisty tags that are nearly impossible to remove! • If each of us reduces a bit, recycles a little, avoids toxic cleaners, buys organic/local occasionally, reuses once-in-a-while, and buys natural often, we can make a positive change for our environment and the health of ourselves and families. Happy Earth Day! Thank You Wanda for a Great Interview! Visit www.mapleshadekids.etsy.com to see more of Wandas work!